News from Ferguson began streaming in last night, and I found myself searching. Searching for answers, searching for justice. As an educator at a higher education institution, who is committed to ending racial, economic, and educational injustice, I found myself thinking about what I had been trying to do this semester, and what more I could do now. The failure to indict Darren Wilson was sadly not surprising. Instead it is a changing same. It speaks to the way oppressions, and racism specifically, are sown into the fabric of our society. As Ruth Wilson Gilmore notes, “racism, specifically, is the sanctioned or extralegal production and exploitation of group-differentiated vulnerability to premature death”. What happened last night was a sanctioning of the legal system as a group differentiated death-dealing machine. 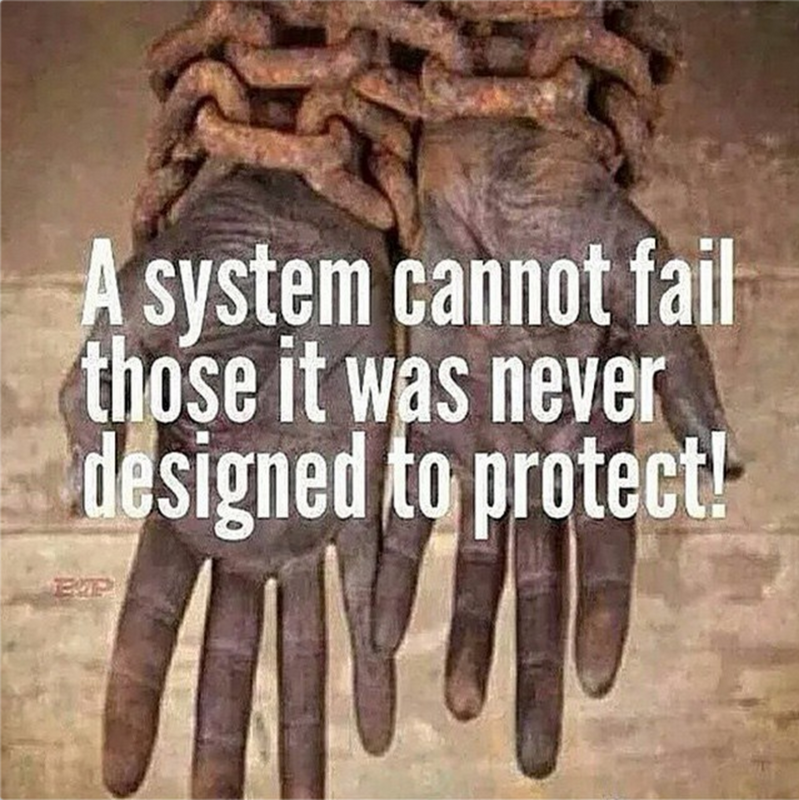 What happened last night is injustice by design within the racial capitalist carceral state in which we live. Clearly the racial and economic conditions in Ferguson, nationally, and globally remain the grounds on which state violence takes place. 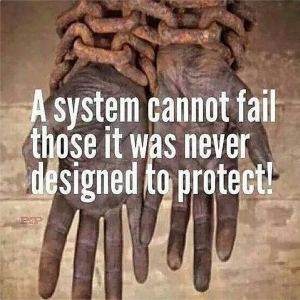 As so many would remind us through tweets and memes a system cannot fail those it was never designed to protect. This is the “changing same” that we must recognize and continue to document and analyze if we are seeking to interrupt it, or downright abolish it. There is more to dissect, analyze and teach about Ferguson, the killing of Michael Brown and the numerous other Black people and people of Color who have died premature deaths at the hands of the state. I have been inspired by the various collections of resources that have been assembled through committed educators who have sought to support educators and parents in working through this tragedy (see resources below). These resources are admirable and extremely useful. Still in my haste to analyze and respond to injustice and to get resources in the hands of my students and fellow educators, I have found that I lose sight of the broader challenge to humanity moments like these pose, and the shock and awe that consequently comes in tow. Last night was no different, I spent a lot of the evening just going through Twitter, reposting tweets that analyze the situation in #Ferguson or noted infomration about marches and demonstrations happening in Missouri and in other cities like nearby Philadelphia. What was different about last night is that as I was scrolling through my Twitter feed, I was also receiving emails from students about a project they were supposed to submit last night. Some students were struggling with uploading documents, while others were asking for extensions because they had not taken into account how much work this was going to entail. And still others were struggling with what was happening in Ferguson and could not complete the work in time. Then in the morning I was going through the routine of helping my five year old get ready for school and I wondered if I should address what is happening with him now? And if not now, when? My students and my son reminded me that we are all human, filled with complicated thoughts, and saturated with emotions. In scrambling to share information with my students I felt like I was neglecting the varied emotions that we were experiencing. I needed to give my students AND myself time and space to grieve over last night’s negation of human life and Black lives in particular. With that in mind I sent out an email to all of my students. I shared information from the night before and encouraged them to continue following social media to remain in the conversation loop. Most importantly, for me, I offered up my office as a space for students to convene if they needed to. Not many students stopped by, but a few did, and several others thanked me via email for sharing information and making the office available. Swarthmore College was also organizing transportation to Philadelphia so that community members could participate in the marches if they sought to. In speaking with those that came by there was a loss for words to describe what they were feeling. At the same time they had a deep desire to speak out against injustice, but were not sure where to speak. What happen last night was painful and enraging, but reaffirmed for me aspects of the ongoing work of educator-activist-scholars. 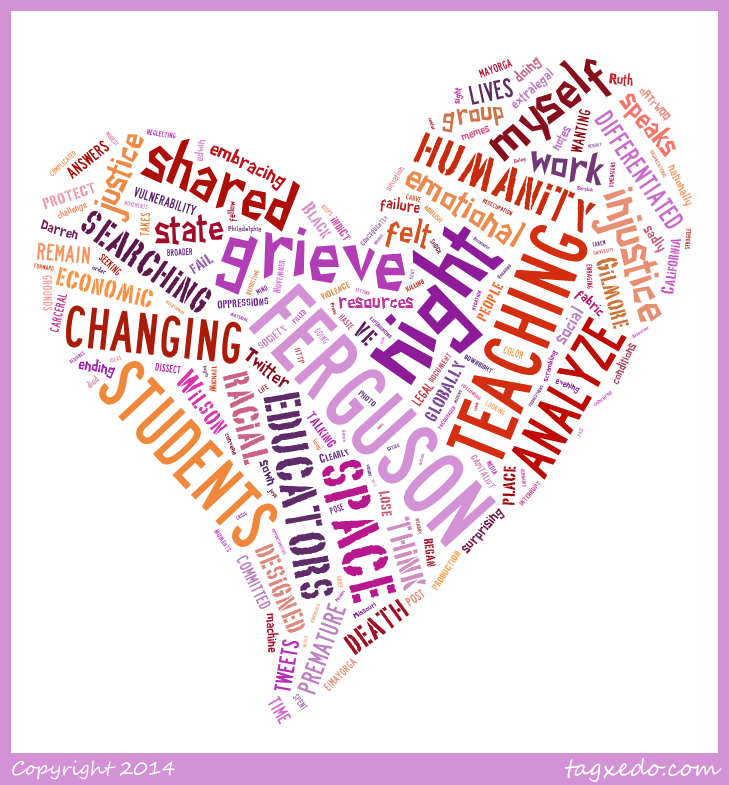 First, it affirmed for me that in looking to carve out spaces for teaching and talking about Ferguson, we must give ourselves opportunities to grieve (again). Engaging our grief, letting it circulate through us, is a part of moving forward. Second, grieving is something not to be done alone. So often when we talk of social movements we lose the emotional and relational dimensions of the work. We certainly have shared material concerns, but the shared joys and pains of struggle are also part of what brings us, and keeps us, together. Spaces for grieving are also spaces for coming together and embracing one another. As I think about the marches that have taken place in the last 24 hours I see them as a reoccupation of space in order to come together. To grieve. To speak out. thank you so much for sharing about the protests in Philly. I really appreciate your dedication to us as students and as people, it really means a lot to me especially as a freshman. I share this not to pat myself on the back, but to highlight the impact of centering people in the higher education classroom. When we show our students that they matter to us, and that the injustices happening in the world must matter to all of us, we are having an impact. Centering people in the classroom is also an ongoing process rather than a reaction. The infrastructure for a people-centered classroom begins in the planning of the curriculum and is as every bit as essential as is the content we teach (I will discuss this point further in my next post). The ideas I am sharing here are modest suggestions, but I think they should remind educators that teaching in the time of Ferguson requires us to teach with our humanity at the center. In carving out spaces to come together we can begin to see each other, and we can begin to connect ourselves to stories of human struggle that are often, intentionally, blurred from sight. In coming together we can find hope in each other, and can begin to take further action. Otherwise, Ferguson by Ashon Crawley. *Thanks to the various folks who have been putting these resources together since August, and specific thanks to Dr. Lee Smithey (@peacesociology) and the New York Collective of Radical Educators (@nycore3000) for sharing many of these resources. 1. Gilmore, R. W. (2007). Golden Gulag: Prisons, Surplus, Crisis, and Opposition in Globalizing California. Berkeley: University of California Press.